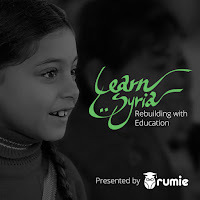 Rumie helping educate Syrian refugees - how can YOU help? I learned about Rumie at a recent Imagine K-12 Educator Day. Rumie is a non-profit that makes education affordable and accessible by using low-cost technology to deliver digital educational content to youth around the world. They have a $50 tablet providing a library for the cost of a book, allowing resource-constrained and offline communities to access high quality educational resources. They're currently in 10 countries and will expand to 15 by 2016. Rumie was named World's Best Social Startup in 2014. They started in 2013. 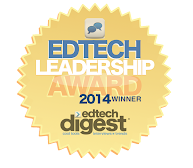 The tablet content is crowdsourced, curated by teachers on the LearnCloud, an online database of free learning resources - like Pinterest for education. Teachers add online content and organize it into collections, collaborating with other teachers as they go, creating a valuable resource for their own use and the use of other educators around the world. This fall, they've launched the #LearnSyria campaign to support education for children in Syrian refugee camps. Here's the need, in the words of Rumie's LearnClould Community Manager Deanna Del Vecchio. "We need your help to curate the best free online learning resources, which will be preloaded onto Rumie tablets and sent to Syrian refugees at the Al-Salam school in Turkey. Join our community in contributing towards our goal of collecting 3000 resources by December 15th. Visit learnsyria.org to find out more and let us know what you can contribute - we're specifically looking for content in Math, Science, Language, and Vocational Skills." Can you help out? Please consider adding to Rumie's collection! Do it today! Thanks in advance supporting this noble cause! Here is our list of top posts for October. Thanks for your continued support! Lots of apps, tons of resources: how to understand..